BRAUNSCHWEIG, GERMANY: Investors took Volkswagen to court to seek compensation for the hit to the carmaker’s share price from its diesel emissions scandal, with plaintiffs holding out hopes for billions of dollars in damages. Shareholders representing 1,670 claims are seeking 9.2 billion euros (US$10.7 billion) in damages over the scandal, which broke in September 2015 and has cost Volkswagen (VW) 27.4 billion euros in penalties and fines so far. 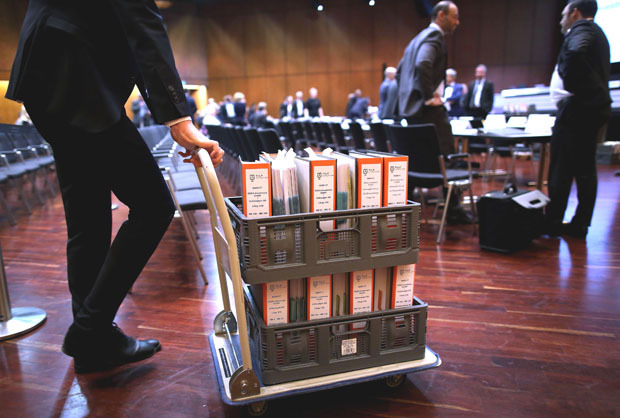 It is likely, however, that only some of the claims will be taken into account because of the statute of limitations, presiding judge Christian Jaede told the Braunschweig higher regional court as proceedings began, without giving a figure. Andreas Tilp, a lawyer for some of the plaintiffs, said he believes that claims worth 2 billion euros of the roughly 5 billion euros he represents have a chance. “We are very confident that there will be money at the end of the day,” he said. Judge Jaede said the case was highly complicated, with many legal questions to be clarified. The court has not yet set a detailed timetable for proceedings in a case that could well end up in a higher court. The plaintiffs say VW failed in its duty to inform investors about the financial impact of the scandal, which became public only after the US Environmental Protection Agency (EPA) issued a ‘notice of violation’ on Sept 18, 2015. Had investors known about VW’s criminal activities in rigging emissions tests, they may have sold shares earlier or not made purchases, thereby avoiding losses on their holdings, the plaintiffs argue. VW shares lost up to 37 percent of their value in the days after authorities exposed illegal levels of pollution emitted from VW diesel cars. The carmaker’s decision between 2005 and 2007 to install cheating software in diesel vehicles was illegal, but it is not clear that it was taken to keep investors in the dark, judge Jaede said. VW has admitted systematic emissions cheating, but denies wrongdoing in matters of regulatory disclosure. A challenge of the case, according to Jaede, is that it covers many incidents stretching back to 2005, with claims before July 9, 2012 potentially invalidated by the statute of limitations, the court said in a summary of proceedings. However, the results of a study into VW diesel engines commissioned by the International Council on Clean Transportation (ICCT) and investigations by US regulators from May 2014 could constitute insider information, the court said. Critical to the case, Jaede said, was the period from early 2014, when he said VW employees had learned that US tests showed its diesel cars emitted far more toxic nitrogen oxide on the road than under laboratory conditions. There is also the question of who within VW knew what, and when, whether the information would actually have had an impact on the share price had it been made public, and if so, how damages should be calculated, the court added. VW’s board did not see the need to brief investors before September 2015 because other carmakers had reached a settlement for emissions cheating without an EPA notice of violation and because VW was in talks about reaching a settlement, the carmaker said in a court filing. It added that board members at the time, including current CEO Herbert Diess and Chairman Hans Dieter Poetsch, did not violate disclosure rules. Plaintiffs, including fund management firm Deka, allege that managers below management board level, including divisional heads, knew early on about deliberate and systematic cheating.